For fifteen years, we have talked about, and gone to war pretending it fixes, the events of September 11, 2001. On that day, I woke suddenly from deep sleep the instant the first plane hit. I lost a college friend that day. Other people lost so much more. We all lost a sort of innocence that day, I think — the idea that the United States was so big, and so prosperous, that no real damage would happen outside of a war. And suddenly we were in a war. A war with a nebulous enemy. A war with no clear targets to strike. But we had the good will of the world behind us, a world that (for the most part) was as shocked and appalled at the targeting of civilians during a time of relative peace in the world. And then things got muddied up by “politics” and we lost the focus. And we are still engaged in wars in a now destabilized and volatile, and expanding, region. It got very messy, very fast. I do not think we are safer, fifteen years later, despite giving up (and having stripped from us) some of our rights. I know that the more we objectify individuals and groups the less free we are. I also know that, historically, when a society vilifies and dehumanizes a group, stripping them of equality, requiring people to conform to a narrow band of behavior, belief and speech, that society is on the downward slope. I know that it won’t stop with one creed, one race, one person — eventually more and more people are caught up and then no one is free. Do we wonder why it is so dangerous to speak up in some countries? It is because when those governments first said “this person/group is a security risk” and instituted small restrictions, no one spoke up. When the first group was arrested, incarcerated, eliminated, the majority stood by silently. And by the time the majority realized they were ALL in danger… that anyone at any time could accuse anyone and that the machinery that had developed no longer cared about guilt or innocence, or intent, or outcomes… only about eliminating people who “might” be a threat to the government…. It is not yet too late in the United States to speak up, to fight for the traditions that underpin the constitution — no matter how unevenly applied in some times and places, no matter that it is imperfect — that ALL are created equal, and ALL are deserving of the same protections and opportunities. Fifteen years ago, the United States’ population allowed a handful of angry, hate-filled people to start unravelling the core of our society. We gave up our freedoms in many ways out of fear and in a desire to be “safe” which we are never going to be. In so doing, the people who planned, carried out, supported, and approved of the murder of thousands — including my friend — were allowed to win. We allowed our freedoms and optimism, the very things that make us “Americans” to be undermined. It is not too late to reverse that trend. Are you eligible and registered to vote? If so, do you vote? Even in local elections, perhaps especially in local elections, every vote counts. We shape our nation and our future by participating in our government. This is a right and privilege still denied to many around the world. WE CAN reclaim our rights and our national pride so that those who would deny us both do not win. We can elect people who keep military “answers” as a very last resort — not weakening our defenses but being more thoughtful and intentional about when to use force, and more intentional about when not to. Don’t let the terrorists win. Don’t let hate win. Work for love. Work for peace. There is never a dull day as a teacher. I have amazing, interesting (and interested!) students this year. They are not all in the same place of course, in terms of life experiences and academic knowledge. But they are all willing to try! I have taught kids of all ages… and the willingness to try, to stick with me, to ask for clarification? That’s the most important quality to learning. We are normalizing the idea of not knowing. We are normalizing the idea of mistakes being okay (I do not allow erasers or erasing in my class!). We are normalizing sitting with discomfort for a while. I am optimistic about the coming year, not because everyone will learn and excel, but because everyone will grow. How much they grow will be depend on many factors under my control (and quite a few outside my control), and this year I have a better handle on what to do, when, and how. Yep. 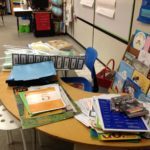 Going to be a GOOD year as a teacher! The summer was not “as advertised” this year. I remained ill for another few weeks, though we had a lovely visit with my grandfather in Ashland at the end of July and saw several plays (LOVED LOVED LOVED Richard II!!!). Was too exhausted, though, to try for the second silk painting session. Hoping for at least one this autumn, though! August arrived, and my heart and brain went quickly into teaching mode. 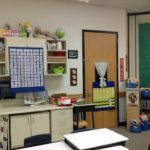 Tom took an extra week off that second week of August to help around the house and the classroom. 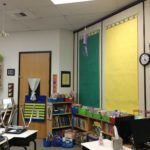 By the end of the third week of August, the classroom was mostly in shape, and in the fourth week it was official training and a couple extra days… so that by the time the kids and parents arrived at 5:30 August 30 the room looked ready enough. Kids in seats on August 31. 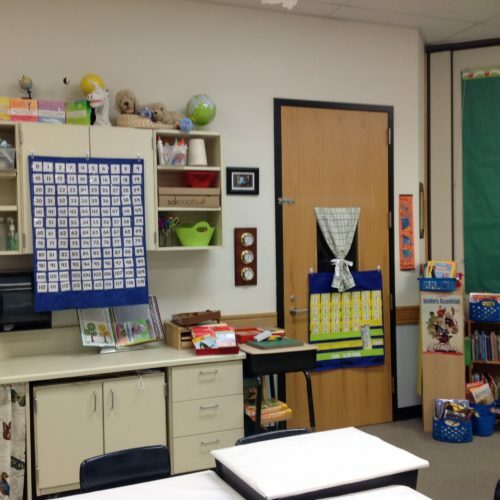 By 2:43 on September 2, the room was already showing evidence of engagement and learning. 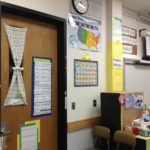 I have a WONDERFUL paraeducator who comes in for 45 minutes in the afternoon to help with literacy and reading, and while we haven’t yet met to decide which few students need intensive pull-out instruction, with the in-class help every day, very few of them will have to leave. 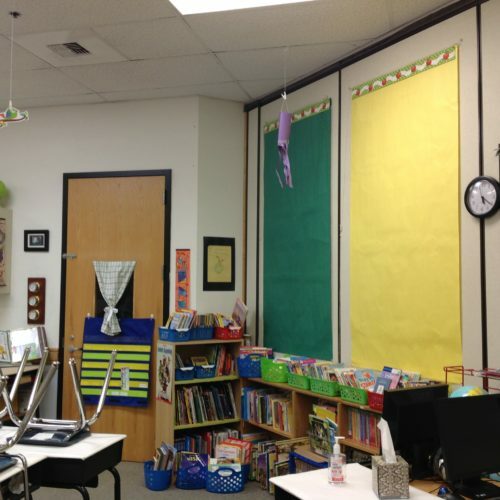 I am so happy in my teacher-heart that I will have most of them all the time! A look toward the door to the restrooms. The number chart goes up when needed, but will be stored flat for a few weeks. 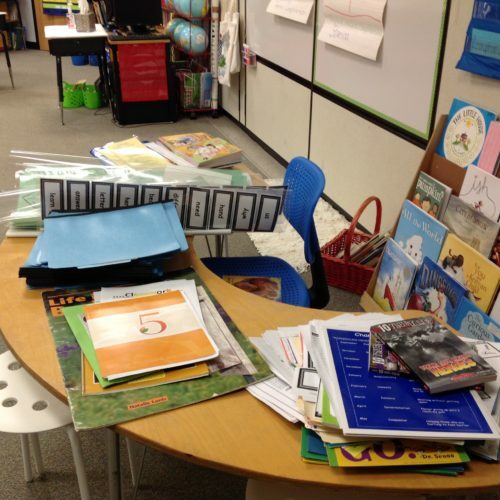 The reading table on Friday– materials to sort, collate, cut, copy, and use next week! The students use these to show something about themselves as we are learning about the new year. Three pictures, and one word! The purple “windsock” was a gift from a student on the second day of school! The empty paper panels on a pulley system! 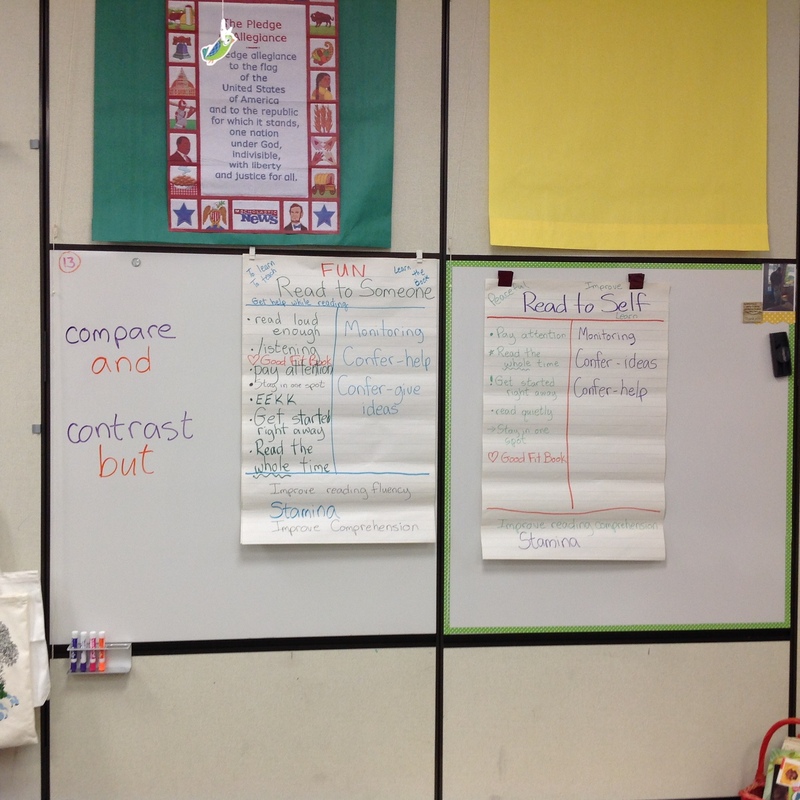 will hold student work and anchor charts. 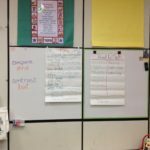 The I-charts are a suggestion from the “Two Sisters” framework for Daily 5 and CAFE instruction. 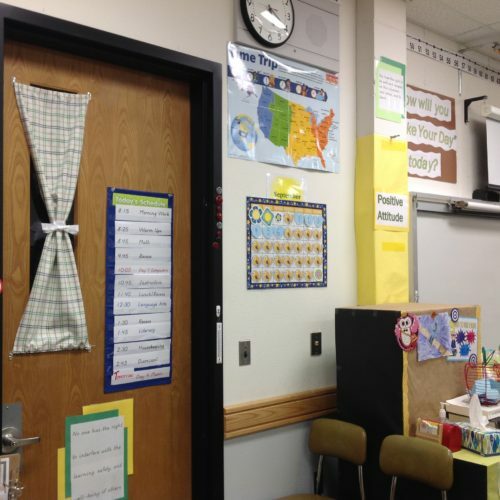 They allow students to consider behaviors and purposes for studying in specific situations. These are our first two.